I know that at Easter there can be snow. Like this year in Switzerland. But for me that’s not acceptable, because Easter should mean spring. Trees in blossom, noisy birds, life re-awakening. So we headed south-west and fled the great freeze. No, in Madrid also it wasn’t really warm. Only when the sun was shining, could you feel the sun. Without a warm hat and my gloves, it would have been really cold. But the people were tremendously warm-hearted, pleasant and talkative. Unfortunately it became apparent that since my last visit 6 years ago, knowledge of the English language had not really improved. We used the Google translator and managed reasonably well. 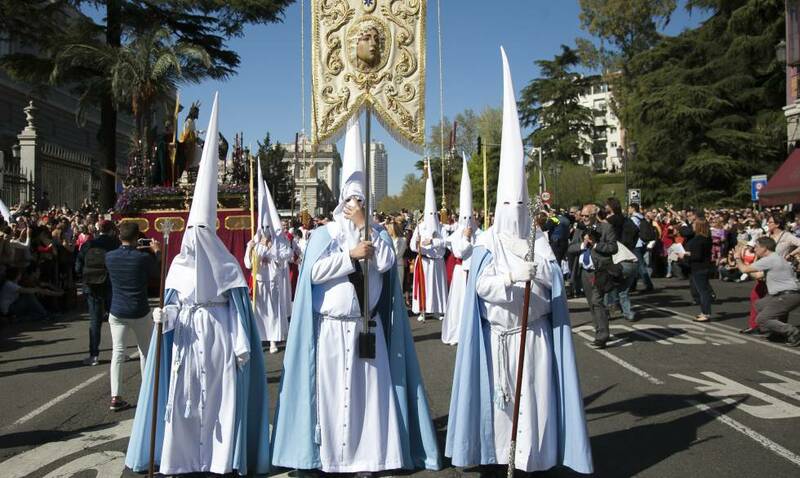 The things you can experience there: attend an Easter Mass with people in festive clothes, admire a procession, in which Jesus Christ is whipped on the way to his crucifixion, accompanied by people wearing a head-dress like the Ku Klux Klan. Visit the Prado and pick out a few paintings by Goya and Hieronymus Bosch and admire them for hours. Go to a Flamenco Show and enjoy to the full the joie de vivre, the passion and complete surrender. Wonder at the many shoe shops and try on the models, which in their colour and fantasy you never see in Switzerland. Our hotel opened 2 days before we arrived, after a complete renovation. The staff were terribly nice and accommodating. For their incredible hospitality we forgave them everything else. Yes, there were various deficiencies. When everything is new, there are small things, which are not as they should be. The lack of warm water was difficult to bear. It is not that there was none, but it was never easy to guess when. Once after my morning jog through the quiet, still sleeping city I had to go under the cold shower. Like lightning, I was finished. Madrid is worth a visit. Because of the atmosphere, the liveliness, the music, the people, the lived friendliness. You can have a warm shower at home.